This interview was conducted by Felicitas Bahr. 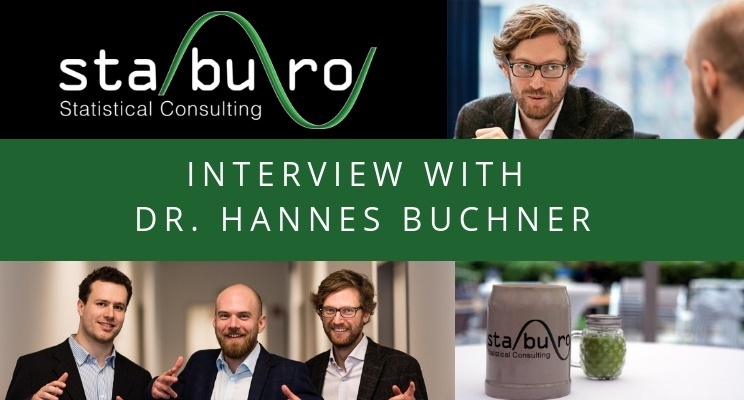 Hello Mr. Buchner, you are ‚Head of Biostatistics’ and run the company Staburo GmbH, alongside Josef Höfler and Roland Stieger. How did you come to start a company? I always wanted to start a company, this was always kind of in my head. I don’t know the exact time anymore, but definitely during my studies. At that time, I was playing volleyball with Roland and we wanted to start something but we didn´t know what we wanted to do. We then came up with a name, Staburo, even though we didn’t know what we wanted to do. By accident, I saw that the university offered courses for people that want to start their own company. There, we had the chance to get some advice and learn something about founding. So, Roland and I went to the ‘unternehmer-TUM’ business plan seminar, which was very, very interesting and very good. The people there always told us ‘Just try it!’. They repeated it so often, that we thought at the end, ‘Ok yes, let´s try it!’. A year later, I met Josef at the university and I found out that he had already taken the same basic course and was thinking about founding a company, too. So, in the next semester Josef and I did this advanced course together, without Roland, because he was abroad at that time. The idea we worked on, in the second year, was a bit different, but both ideas were surprisingly similar to what we do today. Of course, we had to adjust all the time and took advantage of the opportunities we got along the way, which worked out very good so far. What are your tasks? What does your job description Head of Biostatistics mean? So, in principle, I am responsible for everything that’s going on at Staburo from the statistical point of view. I am responsible for most processes, which we developed together. In the past, they were mainly between Josef and me, but now more and more employees take over responsibility. On the other hand, I try to be as less involved as possible in all organizational questions, which Roland is mainly responsible for. Therefore, I can still do statistics, because this is what I love to do! Can you give an example for your management decisions? Specific decisions, I needed to make with Josef and Roland, were especially in the beginning of our company, e.g. hiring new employees. It was very hard for us to make every single decision for a new employee: Can we really afford this? Do we really have enough projects? This was quite time consuming in the beginning, to balance the risks and the benefits. Today, this has become much easier, because we have routine in doing this. On the other hand, the question, if we can afford it, remains, because we have the responsibility for us and all the employees and we don’t want to risk the whole company just for potentially growing in size. We always try to be more on the safe side and don´t take too many risks. Other people sometimes compare us to an old-fashioned family business, but this is exactly how we want to run the company. On the one hand it´s typical that I work on the projects. This is still hands-on programming and statistics, writing statistical analysis plans (SAPs) or giving input to SAPs or projects. Furthermore, I am also quite busy in giving advice to employees. I like this very much and I think I can also contribute a lot there. Not only people with less experience can learn a lot in our projects, I still learn a lot myself, and this is what I like most about my work. However, it is also sometimes not so easy to get hold on me, because I am running from one thing to the other, but my colleagues are very patient with me. There are many different things and many different projects, I am glad to work on. From a statistical point of view, I like the difference of questions and the new challenges. When you realize, in the last ten years, we have done so much at Staburo, we learned a lot. It is great to see, that there is really a value, something you can contribute to the projects and this is what helps the clients at the end and finally helps to improve the lives of patients. We can now cover so many advanced statistical questions and this is very nice to see! What I dislike for sure is, that it is sometimes just too much work. This is probably the only thing. But on the other hand, I always tell me ‘Better too much, then too less!’, that would be worse. So, I definitely sometimes need some time to recover. It is a huge advantage, that we are three managing directors. We always know, that the other two are there and they can take over responsibilities. So, I love our setting! Staburo was growing steadily in the last 10 years. How do you want to shape the future of Staburo? In fact, last year, we had a two-day strategy-meeting and on top many preparation meetings, also follow-up-meetings. There, we developed a road-map and the strategic idea, where we want to go together and how we want to develop until 2022. We always did this in the past, but not in such a detailed and planned fashion. This was also something we learned at the unternehmerTUM, that you really need to make plans! It forces you to think about several things. In general, the plan is to grow a bit more, that’s the strategic plan for 2022. To have 20 fulltime employees until then. But growing is not the only focus, we want to take the right opportunities. It must fit to our competences and to Staburo. We want to keep the focus on statistics and related fields. Recently, we expanded our services to data management and medical writing, on top of our programming with SAS and R. In general, we are happy as it is. The idea is to work here in Staburo, retire here and build up the company in the way that we always have fun at work and like our work. That we love to come to work and as a statistician, programmer or data manager and contribute to drug development and innovation in healthcare. What were the best Staburo experiences you can think of? What were the worst? In my opinion, the best experience at Staburo is first of all, when you can do successful projects and the client is happy about your results and work. The major goal should be that clients want to work with us again or give us a recommendation and honour our efforts. This is one of the best moments at Staburo and this happened several times. Secondly, if people work here at Staburo and are willing to learn things: I really love seeing – and luckily this happened quite often – the progress they make and how they improve over the years. Sometimes, I have the impression, that they become a bit of a different person. If I can see this development and I can feel that Staburo has done its part and has supported them all the time, this is great and makes me happy and a proud. On the opposite, it is sad, when sometimes good people are leaving, and we have invested a lot of resources in their development. This is unfortunate, but surely a part of the game. Now, I´d like to know a few things about you as a person. What was your career orientation like in the past? I studied Statistics at the LMU in Munich. When I started doing this, I had no idea what I want to work later. I didn’t like the studies so much at the beginning. I had the major subject in politics and in economic. I liked politics much more, I guess I spent more time in this part at the beginning of my studies. Luckily, I decided to continue both and later in my studies began to really love statistics! I tried to go to every lecture, even when I didn’t need to go there anymore. Suddenly, one moment, one of the lectures was about “longitudinal data analysis” and was taught by the biostatistics department – at that time, luckily, the biostatisticians taught it, instead of the economic department. I really liked the examples, I realized, this is an area, where it’s worth to spend efforts and resources. To have patients, to improve healthcare. This is, until today, what makes me love my work! I realized this quite late in my studies. But it was still in time, so I could do my master thesis in biostatistics. I had already a clinical dataset to analyse, and this was basically the start of my career in biostatistics. After my studies, I had quite a good connection to my professor and he offered me a postgraduate position. I thought that would be a good chance to do things in parallel: a) start my own business, b) learn more about biostatistics and c) keep some personal freedom to try things at the university. This is what I loved about this time. I had the possibility to do research and think about starting my own business. It was a fortunate situation for me, thanks to chance – which I consider to be my friend. Were there any further special experiences of your career you want to talk about? I had the chance to work in many submission projects and different submission teams. If you can see that the compound is successful, as well as the study, and you submit it to the agencies and it is really brought to the market – and in the end to the patient – this is a great thing! Because you can feel, that you were able to contribute something! I like this very much, you have a lot of pressure and it is always very time critical, but if it is successful in the end, it´s worth it! Thank you for all your answers, I have one last question in the end. What are you proud of at work or privately? I am very proud of Staburo and many things we set up here, especially our ideas on how our working environment looks like. If people like to work here and like to work with us, this makes me very proud, as well. We also try to celebrate these moments regularly. I am proud of how many competencies we have at Staburo, we can offer so many different services to our clients, in the field of statistics. We have so much expertise here, that’s great for me to see! Yes, and privately I am very proud of my two kids! I love them, and it is great to see them growing up!